I was invited to attend a function by Astral Foods at Jenny Morris’s The Cooks Playground. Astral Foods have under their umbrella Goldi Chicken, Festive, Early Bird Farm, County Fair as well as several other chicken, and chicken feed brands. The day started with a tour of the abattoir facilities, which I did not attend due to work commitments. 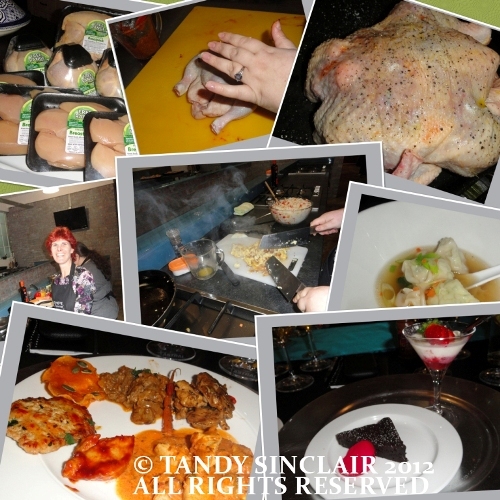 This was followed by an interactive session where we got to cook various dishes, and then eat them. I teamed up with Hila from Add to Taste, and we created a harissa chicken dish that is so easy to make, and tastes fantastic. As this was done with no hassles and really quickly, we moved on to completing two rice dishes to accompany the other dishes being cooked. At the end of our wonderful afternoon, we were sent home with a cooler bag full of chicken. I got home and portioned 8 meals for us, as well as giving some of the chicken to my domestic goddess for her family to enjoy as I believe in ‘paying it forward’. Using the chicken I received, I created a pasta dish for Dave and I for a weekend supper. Have you ever been to an abattoir? 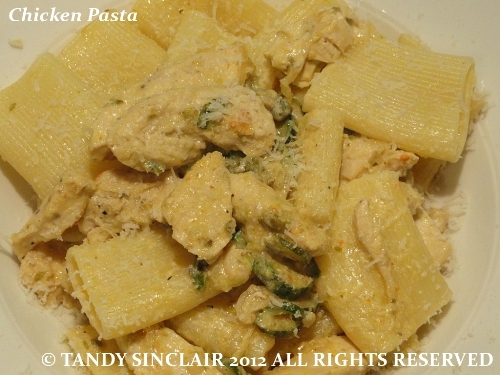 I am submitting this recipe to Presto Pasta Nights, which is being hosted this week by Ruth, the founder of this group. Disclosure: I was given the chicken as a thank you for attending the function. I was not asked to provide a blog post in exchange for my attendance. This post is in line with my blogging policy. I never have been to an abattoir and I must say, I don’t intend to any time soon. That said, the rest of the day sounds wonderful, as does the chicken pasta. Thanks for sharing both with Presto Pasta Nights. It’s good to see you are on G+, your link to Tandy Sales isn’t working correctly,I couldn’t comment there. No, I haven’t been to an abattoir yet. Hi Linda, thanks for telling me – I put a comma instead of a full stop in the url! I once drove very close to a Cornish abattoir late at night 🙂 It is the closest I ahve been. Glad you had a successful workshop! Lovely dish, Tandy! I’ve never been at an abattoir. Loved your photo montage too! How much pasta did you use? It isn’t stated in the ingredients & how much in grams? Haven’t been to an abbatoir…wouldn’t want to give up meat totally!!! It looks really delicious and creamy. That pasta looks great! I like the idea of pairing capers with a creamy sauce. Chicken and pasta always go so well together.